Wanted For Murder Of Marine, Rogue Cop Shows Up At City Jail ... developing story, check back for updates. According to Baltimore Police, Ofc. 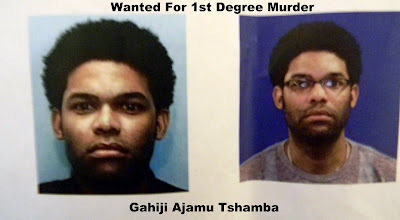 Gahiji Tshamba who eluded a massive manhunt on a first degree murder warrant for nearly two days, turned himself in around 1:30 am Sunday morning. Tshamba is said to have showed up at Baltimore's Central Booking And Intake Facility, commonly known as Central Booking. The facility serves as a first point of detention for persons arrested in Baltimore City. Due to the nature of the charge, Tshamba will automatically be held without bail. The surrender comes after an intense period of searching begging Friday evening when a rare first degree murder warrant was authorized and issued for Tshamba. The warrant came a full week after the shooting death of Tyrone Brown. During the ensuing week between the shooting and the warrant, Baltimore residents voiced fierce opposition and displeasure. Calling for the resignation of everyone from State's Attorney Patricia Jessamy, to Police Commissioner Frederick Bealefeld III, residents flooded online talk and comment forums, along with barraging local talk radio programs in order to air sentiments of anger and frustration. On Saturday night a candle light vigil in front of City Hall was held by family and friends. a few short blocks away at the same time, was a press conference held by Baltimore Police. At the time of the press conference, Baltimore Police along with members of the regional Warrant Apprehension Task Force were actively seeking the whereabouts of Tshamba. The surrender came as a relief to many including Reginald Dargan, the father of victim Tyrone Brown. Contacted at home by the Baltimore Spectator, awoken from sleep, Dargan said "Oh thank God, thank you for telling me!" See continued comprehensive coverage and read our my detailed step by step, as-it-happened breaking stories on Investigative Voice, the Voice of The People. Posted by A.F. James MacArthur Ph.A.L.